The Singlefold Ramp by PVI combines lightweight materials with amazing strength to give you the perfect product for either a short or long-term need. 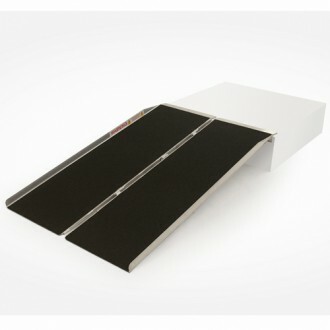 With a range in lengths from 2 ft - 8 ft, the Singlefold Ramp by PVI is sure to fit your need. This product is covered edge-to-edge with superior traction tape that allows for a slip-resistant surface in any weather condition. Award Winning Design “Worlds Greatest Access Ramp"
Product Weight 10 lbs. - 46 lbs. Click the button below to add the PVI Singlefold Ramp to your wish list.